1 A None No Power Seat 1 A is a standard Economy Class seat located in an Exit Row. The seat has additional legroom. The tray table is installed in the armrest making the armrest immovable and slightly reducing seat width. The proximity to the lavatory might be bothersome. 1 B None No Power Seat 1 B is a standard Economy Class seat located in an Exit Row. The seat has additional legroom. The tray table is installed in the armrest making the armrest immovable and slightly reducing seat width. The proximity to the lavatory might be bothersome. 11 D None No Power Seat 11 D is a standard Economy Class seat that is missing a window. 2 C None No Power Seat 2 C is a standard Economy Class seat located in an Exit Row. The seat has additional legroom. The tray table is installed in the armrest making the armrest immovable and slightly reducing seat width. The proximity to the lavatory might be bothersome. 2 D None No Power Seat 2 D is a standard Economy Class seat located in an Exit Row. The seat has additional legroom. The tray table is installed in the armrest making the armrest immovable and slightly reducing seat width. The proximity to the lavatory might be bothersome. 21 A None No Power Seat 21 A is a standard Economy Class seat located in the last row of the aircraft. Seat back recline might be limited. The proximity to the galley might be bothersome. 21 B None No Power Seat 21 B is a standard Economy Class seat located in the last row of the aircraft. Seat back recline might be limited. The proximity to the galley might be bothersome. 21 C None No Power Seat 21 C is a standard Economy Class seat located in the last row of the aircraft. Seat back recline might be limited. The proximity to the galley might be bothersome. 21 D None No Power Seat 21 D is a standard Economy Class seat located in the last row of the aircraft. Seat back recline might be limited. The proximity to the galley might be bothersome. Beverages and snacks are available on Olympic Air flights for Aegean Airlines depending length of flight. The Bombardier Q400 aircraft line entered service in 2000. It is one of the most successful twin-turboprop airlines used to provide service on short- to medium-haul routes. 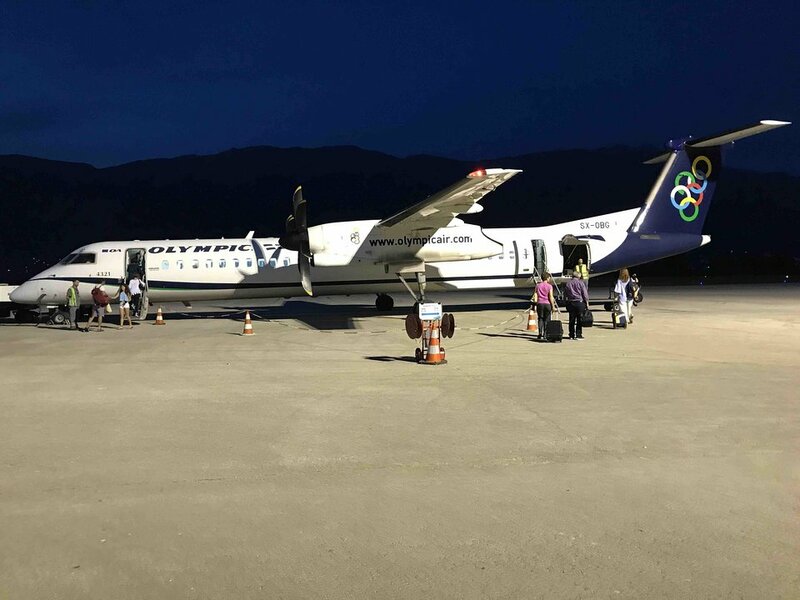 The aircraft is flown by Olympic Air for Aegean Airlines on short- and medium-haul feeder flights. Aegean Airlines flies 1 versions of Bombardier Q400.